What to Know to Attend Ciclovia de Dallas! DALLAS – On Saturday, April 14th from 9:00 am – 3:00 pm ride your bicycle, walk your dog, push your stroller, roller skate, ride a unicycle or skateboard, whatever it takes to get out to the 1st Annual Ciclovia de Dallas on the centennial Houston St. Viaduct Bridge for Dallas’ first car-free festival. EVENT TIMES: 9:00 am – 3:00 pm FREE TO ATTEND! To Access the bridge from the Oak Cliff or Downtown side by any means EXCEPTa car. Downtown: Head down Houston St. past Union Station. The street will be closed at Young and Houston St. Enter bridge from here. 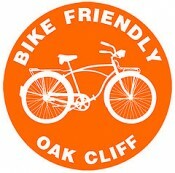 Oak Cliff: Head down Zang towards downtown. Cross the street before Jefferson St bridge near Greenbriar heading against the normal one way access. Enter bridge from here. DOWNTOWN PARKING: Free parking is available at the old Reunion Arena. ← Third day of iBike Rosemont and the bike riders grows!